Description: One of the hottest products in the event industry and its now available at JLA party rentals, The Mirror Me Booth. Its is not your traditional Photo Booth, this is a unique photo-generating mirror that posses the latest technology in interactive picture taking. The Mirror Me Booth offers a sleek design and a user-friendly interface, communicating with guest through a touch screen of colorful animations and entertaining voice guidance. Often referred to as the Magic mirror, this Mirror Me booth is perfect for different types of event like weddings, birthdays, corporate events, and many others. 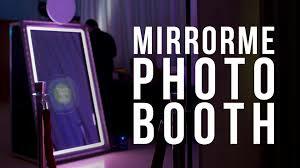 Give us a call for pricing and availability of the mirror me booth rental, our pricing included unlimited prints!